As more people test their Y-DNA and join the FTDNA database, people who have been in the Ungrouped section of the project will suddenly find that they have a new close match and this instantly creates a new genetic family. This has just happened in the Ryan DNA Project and as a result a new genetic family has been born. Just today, a new project member (JR-7435)* joined the project and he was an instant match to an existing project member (PAR-2453) in the Ungrouped section. In fact, when comparing this new member's 67-marker profile against everyone else's in the FTDNA database, he has 3 matches: a Rowan (with a Genetic Distance of 4/67), a Ryan (GD 5/67) and a Loftus (GD 7/67). 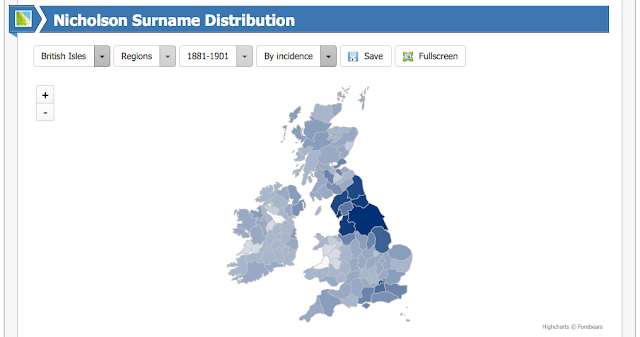 So it looks like this provides a direct genetic link between the Ryan surname and the Rowan surname. is the genetic connection between the Ryan's and the Rowan's a "true match" or a "false match" (due to Convergence)? if it is a true match, which came first: the Mulvihill chicken or the Ryan / Rowan egg? Was there some sort of a Surname or DNA Switch (SDS) somewhere along the direct male line of these genetically matching individuals? This is illustrated in the diagram below from The Big Tree. The yellow circles mark the locations of DF17 and FGC14115. 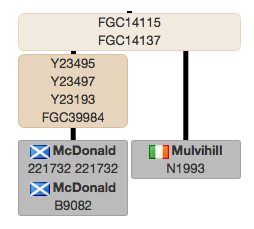 Note that there is also a Mulvihill sitting below FGC14115, and this strongly supports the notion that the genetic match between the Mulvihill's and the Ryan / Rowan surname is in fact a "true match". So that just leaves us with the question: which came first? Did the Rowan's become Mulvihill's and Ryan's? or were the Ryan's the progenitors? or were the Mulvihill's the father of them all? The Rowan matches are not in the Ryan project so I invited them all to join. One of the Mulvihill matches (N1993) has done the Big Y test so I have invited him to join too (for comparison purposes). The existing project member (PAR-2453) has already done the Big Y test and I will ask him to upload it to the Big Tree (instructions here) so that we can get some additional (free) analyses that will further elucidate the relationship between the Ryan and Mulvihill surnames. The Mulvihill individual on the Big Tree (see close up above) has 5 unique SNPs (not shared with anyone else in the database), which (crudely) represents about 500-750 years of time. This suggests that the Mulvihill line branched away from FGC14115 about 1200 to 1450 AD (very approximately). When project member PAR-2453 uploads his Big Y data to the Big Tree, it is likely that some or all of these 5 unique SNPs will form a new branch below FGC14115 ... and below this new branch, we will find both Mulvihill N1993 and PAR-2453, each perhaps with 2 or 3 unique SNP markers of their own. This may also give us an idea of when the split between the Ryan and Mulvihill surname took place, and by extension, which came first: the chicken or the egg. Unfortunately not many people include the birth location of their MDKA (Most Distant Known Ancestor) in their profile so it is not easy to see from what county in Ireland people originated. This is essential information to include and I encourage all project members to amend their profiles to include this information. You can read about how to do it here. PAR-2453 has included this information (mega-brownie points) and we can see that his ancestors came from Kilkenny. 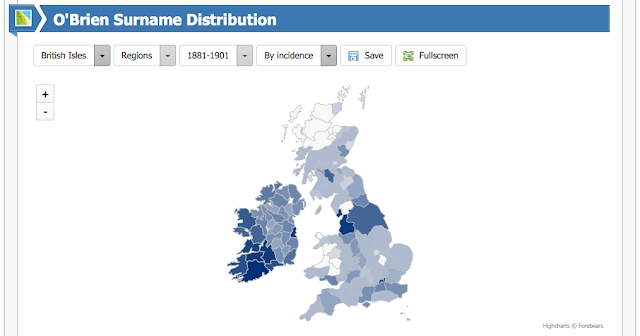 Among his matches, one Mulvihill has origins in Longford, another in Limerick, but the rest have no MDKA data. 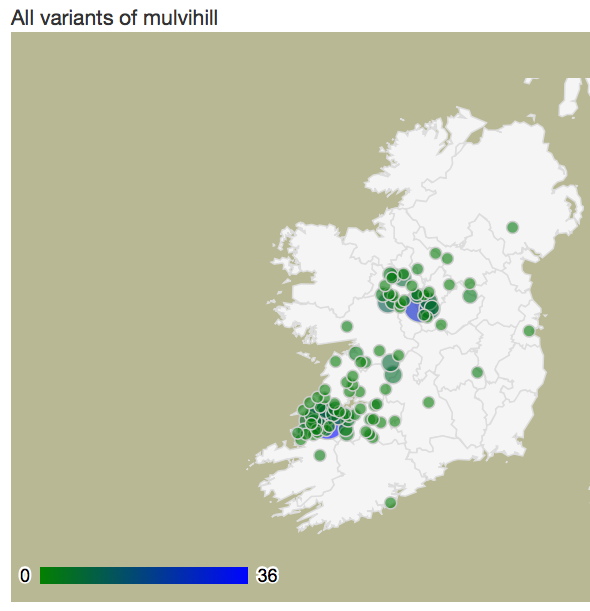 There is a Mulvihill DNA Project and on reviewing their public DNA Results Page, there is a suggestion that the particular branch of the Mulvihill's who are FGC14115+ comes from North Kerry (although unfortunately, individual MDKA data is not displayed). There is also a Rowan DNA Project but their public DNA Results Page does not offer any insights (again, sadly, no MDKA information is displayed). Surname Distribution Maps indicate two hotspots for the Mulvihill surname in the mid-1800s ... Longford and Clare / Limerick. Either of these two places could indicate the genetic origin of this group of related surnames. The map for the Rowan surname shows a less localised distribution for that particular surname and offers no additional clues. It would be interesting to see if the Admins of the Rowan and Mulvihill DNA Projects have any further insights to offer as to the likely origins of this group. There are some incredible discounts in the current FTDNA Sale which lasts from now until Nov 22nd. And there will probably be a Christmas Sale after that. So now is the time to start thinking about getting that upgrade or that extra kit. Below are the sale prices and they are the lowest I have ever seen. and $100-140 off Big Y upgrades. This feels more like Crazy Eddie's Second Hand Car Deals! If you have any questions about your own particular situation, just drop me an email. The DNA results of a new member of the Ryan Project have recently come back from the lab and this has allowed us to add several new members to Group 7 of the DNA Project. Who does the new member match? This indicates that most of the new member's 25-marker matches (who have SNP data) fall on or below the BY182 branch of the Tree of Mankind (as does member 310545) and so I am reasonably confident that the new member does too. As a result, I have placed him and the first Ryan match (previously Ungrouped) in the same group as 310545 (i.e. Group 7). You can see this on the DNA Results page here. We could check that this placement of the new member is correct by doing the Big Y test ($650) or the cheaper R-S6365 SNP Pack ($119 - see SNPs covered at the end of this post) or the single SNP BY182 ($39). However, the Big Y is the preferred test in this situation as it will help identify branches “downstream” of BY182 and will eventually identify if there is a Ryan-specific branch for this particular genetic group. Where does Group 7 sit on the Tree of Mankind? You can see a diagram of the BY182 portion of the Tree of Mankind below (which is taken from here … http://www.ytree.net/DisplayTree.php?blockID=510&star=false). Based on the number of SNPs in the Nicholson blocks, BY182 is (very) approximately 2250 years old. The Group 7 Ryan’s lie somewhere below this … and a lot can happen in 2250 years! Hence Big Y testing of two group members would be very informative and would probably identify several “more downstream” branches for this Ryan group below BY182. 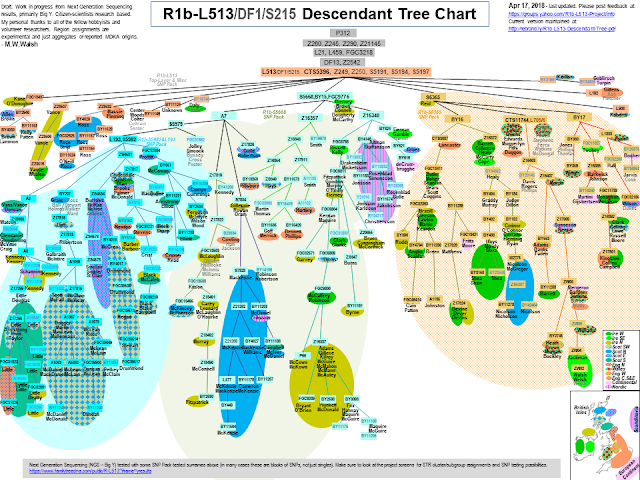 The R-L513 & Subclades project provides a little bit more detail than the Big Tree diagram above. The Ryan portion is in the middle of the large circular blob on the right, above the blue (Nicholson) oval. All members of the Ryan project should join the relevant Haplogroup projects and for Group 7 members, the relevant project is the R-L513 & Subclades project. Where is Group 7 from? Only one of the members in Group 7 has indicated the exact birth location of their MDKA (Most Distant Known Ancestor) and this is Cork, Ireland … so this is one clue to where this group possibly originated. Another clue to the origin of this genetic group could potentially be gleaned from the surnames on the neighbouring branches of the Tree of Mankind, and from the close matches identified by the relevant Haplogroup Project (in this case the R-L513 & Subclades project). These include the surnames indicated below. Note that the O’Brien individual gives Kerry as his MDKA’s birth location (Kerry is the neighbouring county to Cork). BY182+ individuals, as identified by the R-L513 & Subclades project. Unfortunately, Surname Distribution maps for each of these names do not suggest a specific most likely location for the origins of this group of Ryan’s. You can see a selection of these maps at the end of this post. Having this information is essential for determining where the various genetic groups in the project originated. How closely related is the new member to his closest matches? The new project member has a Genetic Distance (GD) of 4/37 to his first Ryan match (i.e. 4 steps away from an exact match) and a GD of 5/37 to 310545 Consequently, the TiP Report tool predicts he and the first Ryan match share a common Ryan ancestor about 6 generations ago (90% Confidence Interval 1-14 gens) and he & 310545 share one about 8 generations ago (90% CI 3-18 gens). These TMRCA estimates (i.e. Time to Most recent Common Ancestor) translate into a birth year for the common ancestor of about 1770 (1580-1920) and 1710 (1410-1860) with both matches respectively. Note the wide range around the mid-point estimates - these indicate how inexact these TMRCA estimates actually are and (in general) they should never be relied upon. Also of note, the mid-point estimates (1770 & 1710) are probably beyond the reach of documentary records. All members should update their MDKA information as indicated above. Having the birth location of the MDKA for each member of the project is essential. At least two members of the group should undertake Big Y testing. This will help firmly identify on which downstream branch of the Tree of Mankind these Ryans sit. and tick the "Opt in to Sharing" box beside the first option "Group Project Profile". These results are pseudonymised (i.e. your name is not displayed) and so your identity is kept private. The SNP markers covered by the S6365 SNP pack are indicated below. The ones of relevance to Group 7 are highlighted in yellow. Surname Distribution maps of the close genetic cousins to the Group 7 Ryan's are below. 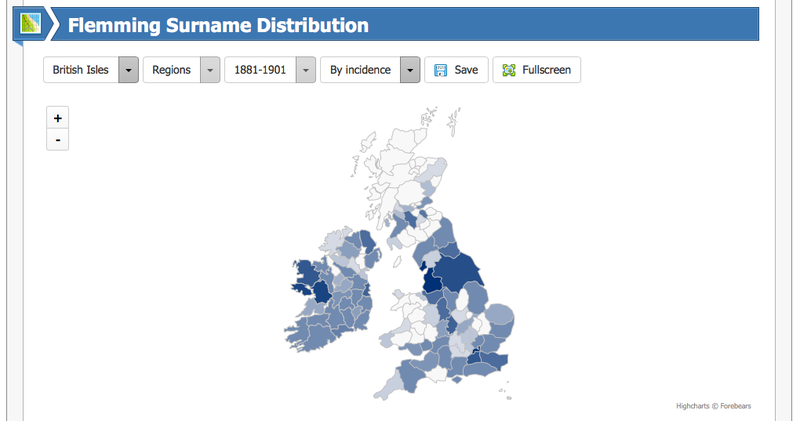 These are from http://forebears.co.uk/surnames. There is no definite pattern that emerges from these maps to suggest a place of origin for the Ryan's of Group 7. In the first of a number of articles, here is one of the two Ryan pedigrees recorded by O'Hart in his book Irish pedigrees; or, The origin and stem of the Irish nation. This pedigree (Ryan No. 1) specifically relates to the Ryan's of Carlow, the Lords of Idrone, as described by Woulfe, MacLysaght & O'Hart in their respective surname dictionaries (see previous post). They in turn were descended from the Kings of Leinster (specifically Clan Moroghoe), who in turn were descended from the Lords of Offaly, who in turn were descended from the Line of Heremon. These are abstracted from O'Hart's book in chronological order below (and thus the Ryan's will be the last). Note that the numbers are not sequential because the information is sourced from a variety of different pedigrees in O'Hart's book. The line of the Ryan's of Carlow is associated with a variety of other surnames and not all are included here as there were many branches that broke away from the main Ryan branch and later developed into different surnames. However, it may be important to review this in due course as such surnames should be genetically related to the Ryan's of Carlow. Also of note, this branch of the Ryan's is descended from a man called Breassal Breac and thus there should be a genetic connection with those people in the Breassal Breac DNA Project at FTDNA. And, most importantly, the Ryan's of Owney & Owneybeg (Tipperary / Limerick), who moved there in the 13th / 14th Century (see previous post), are said to have sprung from the same stock as the Ryan's of Carlow. MacLysaght claims that their common ancestor is Cathaoir Mór, King of Leinster in the 2nd Century. If this is true, then we should see a (distant) genetic connection between the Ryan's of Carlow and the Ryan's of Owney & Owneybeg. I have retained the NOTES relating to O'Hart's text so if you want to explore them further you should refer to O'Hart's book itself (the link to each section is in the title for each section). Note that there is a mistake / inconsistency when we get down to the first entry for the Ryan pedigree ... was the original ancestor Cormac? or his nephew Fergus? Either way, it won't affect the Y-DNA ... it should be the same no matter which man was the ancestor. At some point, it may be useful to calculate crude dates of birth for each of the people in the pedigree. 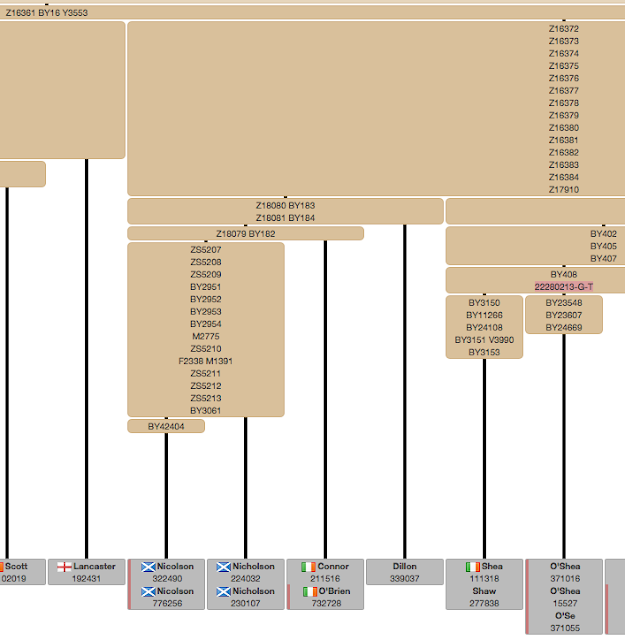 This may help if and when we construct a "Mutation History Tree" for the Ryan's of Carlow and attempt to map this tree (built from genetic data) onto the pedigree below (with all its associated non-Ryan surnames). HEREMON was the seventh son of Milesius of Spain (who is No. 36, p. 50), but the third of the three sons who left any issue. From him were descended the Kings, Nobility, and Gentry of the Kingdoms of Connaught, Dalriada, Leinster, Meath, Orgiall, Ossory; of Scotland, since the fifth century; of Ulster, since the fourth century; and of England, from the reign of King Henry II., down to the present time. THE STEM OF THE "LINE OF HEREMON." THE Stem of the Irish Nation from Heremon down to (No. 81) Art Eanfhear, Monarch of Ireland in the second century, who was the ancestor of O'h-Airt, anglicised O'Hart. "The House of Heremon," writes O'Callaghan, "from the number of its princes, or great families—from the multitude of its distinguished characters, as laymen or churchmen—and from the extensive territories acquired by those belonging to it, at home and abroad, or in Alba as well as in Ireland—was regarded as by far the most illustrious: so much so, according to the best native authority, that it would be as reasonable to affirm that one pound is equal in value to one hundred pounds, as it would be to compare any other line with that of Heremon." 38. Irial Faidh ("faidh": Irish, a prophet): his son; was the 10th Monarch of Ireland; d. B.C. 1670. This was a very learned King; could foretell things to come; and caused much of the country to be cleared of the ancient forests. He likewise built seven royal palaces, viz., Rath Ciombaoith, Rath Coincheada, Rath Mothuig, Rath Buirioch, Rath Luachat, Rath Croicne, and Rath Boachoill. He won four remarkable battles over his enemies:—Ard Inmath, at Teabtha, where Stirne, the son of Dubh, son of Fomhar, was slain; the second battle was at Teanmhuighe, against the Fomhoraice, where Eichtghe, their leader, was slain; the third was the battle of Loch Muighe, where Lugrot, the son of Moghfeibhis, was slain; and the fourth was the battle of Cuill Martho, where the four sons of Heber were defeated. Irial died in the second year after this battle, having reigned 10 years, and was buried at Magh Muagh. 41. Tigernmas : his son; was the 13th Monarch, and reigned 77 years; according to Keating, he reigned but 50 years; he fought twenty-seven battles with the followers of the family of Heber Fionn, all which he gained. In his reign gold was mined near the Liffey, and skilfully worked by Inchadhan. This King also made a law that each grade of society should be known by the number of colours in its wearing apparel:—the clothes of a slave should be of one colour; those of a soldier of two; the dress of a commanding officer to be of three colours; a gentleman's dress, who kept a table for the free entertainment of strangers, to be of four colours; five colours to be allowed to the nobility (the chiefs); and the King, Queen, and Royal Family, as well as the Druids, historians, and other learned men to wear six colours. 47. Rotheachtach : his son; was the 22nd Monarch; slain, B.C. 1357, by Sedne (or Seadhna), of the Line of Heremon. 55. Muredach Bolgach: his son; was the 46th Monarch; killed by Eadhna Dearg, B.C. 892; he had two sons— Duach Teamhrach, and Fiacha. 59. Ugaine Mór : his son. This Ugaine (or Hugony) the Great was the 66th Monarch of Ireland. Was called Mór on account of his extensive dominions,—being soveeign of all the Islands of Western Europe. Was married to Caesair, dau. to the King of France, and by her had issue—twenty-two sons and three daughters. In order to prevent these children encroaching on each other he divided the Kingdom into twenty-five portions, allotting to each his (or her) distinct inheritance. By means of this division the taxes of the country were collected during the succeeding 300 years. All the sons died without issue except two, viz:—Laeghaire Lorc, ancestor of all the Leinster Heremonians; and Cobthach Caolbhreagh, from whom the Heremonians of Leath Cuinn, viz., Meath, Ulster, and Conacht derive their pedigree. Ugaine was at length, B.C. 593, slain by Badhbhchadh, who failed to secure the fruits of his murder—the Irish Throne, as he was executed by order of Laeghaire Lorc, the murdered Monarch's son, who became the 68th Monarch. 60. Colethach Caol-bhreagh: son of Ugaine Mór; was the 69th Monarch; it is said, that, to secure the Throne, he assassinated his brother Laeghaire; after a long reign he was at length slain by Maion, his nephew, B.C. 641. Connaught: In other parts of this Work "Connaught" is spelled Conacht; as we found it in the MS. or Work which we consulted. Heremon: According to the "Book of Ballymote," the river "Liffey" derived its name from the circumstance of a battle having been fought near it by the Milesians, against the Tua-de-Danans; and the horse of the Milesian Monarch Heremon, which was named Gabhar [gavar] Liffe" (gabhar: ancient Scotic and British word for the Lat. "eq-uus," a horse, which, in modern Irish, is "each" [ogh], a steed), having been killed there, the river was called "Liffe" or "Liffey." In Irish it was called "Amhan Liffe (Amhan: Irish, a river; Lat. amn-is), signifying the River Liffey, which was first anglicised Avon Liffey," and, in modern times, changed to Anna Liffey—the river on which the city of Dublin is built. Muimne: This Monarch was buried at Cruachan (cruachan: Irish, a little hill) or Croaghan, situated near Elphin, in the county of Roscommon. In the early ages, Croaghan became the capital of Connaught and a residence of the ancient Kings of Ireland; and at Croaghan the states of Connaught held conventions, to make laws and inaugurate their Kings. There, too, about a century before the Christian era, the Monarch Eochy Feidlioch (No. 72 in this stem) erected a royal residence and a great rath, called "Rath-Cruachan," after his queen, Cruachan Croidheirg (Croidheirg; Irish, a rising heart), mother of Maud, the celebrated queen of Connaught, who, wearing on her head "Aision" orgolden crown, and seated in her gilded war-chariot surrounded by several other war-chariots, commanded in person, like the ancient queens of the Amazons, her Connaught forces, in the memorable seven years' war against the Red Branch Knights of Ulster, who were commanded by King Connor MacNessa, as mentioned in our ancient records.—CONNELLAN". Tigernmas (or Tiernmas): This Tiernmas was the Monarch who set up the famous idol called "Crom Cruach" (literally, the crooked heap) on the plain of Magh Sleaght, now Fenagh, in the barony of Mohill, county of Leitrim. This idol was worshipped up to the time of St. Patrick, by whom it was destroyed. Among the idol-worship of the ancient Irish at that time was that of the sun: the sun-worship which was that of the Magi or wise men of the East, who, we are told in Scripture, were led to Bethlehem by divine inspiration to see the Infant Jesus. This Monarch introduced certain distinctions in rank among the Irish, which were indicated by the wearing of certain colours, which, by some persons, is believed to have been the origin of the Scotch plaid. According to Keatinge, one colour was used in the dress of a slave; two colours in that of a plebeian; three, in that of a soldier or young lord; four, in that of a brughaidh or public victualler; five, in that of a lord of a tuath or cantred; and six colours in that of an ollamh or chief professor of any of the liberal arts, and in that of the king and queen—BOOK OF RIGHTS. Rotheachtach: Silver shields were made, and four- horse chariots were first used. in Ireland, in the reign of this Monarch. Ugaine Mór: In the early ages the Irish Kings made many military expeditions into foreign countries. Ugaine Mór, called by O'Flaherty, in his Ogygia, "Hugonius Magnus," was contemporary with Alexander the Great; and is stated to have sailed with a fleet into the Mediterranean, landed his forces in Africa, and also attacked Sicily; and having proceeded to Gaul, was married to Caesair, daughter of the King of the Gauls. Hugonius was buried at Cruachan. The Irish sent, during the Punic wars, auxiliary troops to their Celtic Brethren, the Gauls; who in their alliance with the Carthaginians under Hannibal, fought against the Roman armies in Spain and Italy—CONNELLAN. LAEGHAIRE LORC, an elder brother of Cobthach Caol-bhreagh who is No. 60 on the "Line of Heremon," was the ancestor of O'Connor Faley. 60. Laeghaire Lorc, the 68th Monarch of Ireland: son of Ugaine Mór; began to reign, B.C. 593. 61. Olioll Aine: his son. 62. Labhradh Longseach: his son. 63. Olioll Bracan: his son. 64. Æneas Ollamh: his son; the 73rd Monarch. 66. Fergus Fortamhail, the 80th Monarch: his son; slain B.C. 384. 67. Felim Fortuin: his son. 68. Crimthann Coscrach: his son; the 85th Monarch. 71. Allod (by some called Olioll): his son. 72. Nuadh Falaid: his son. 73. Fearach Foghlas: his son. 74. Olioll Glas: his son. 75. Fiacha Fobrug: his son. 76. Breassal Breac: his son. Had two sons—1. Lughaidh, 2. Conla, between whom he divided his country, viz.—to his eldest son Lughaidh [Luy], who was ancestor of the Kings, nobility, and gentry of Leinster, he gave all the territories on the north side of the river Bearbha (now the "Barrow"), from Wicklow to Drogheda; and to his son Conla, who was ancestor of the Kings, nobility, and gentry of Ossory, he gave the south part, from the said river to the sea. 77. Luy: son of Breassal Breac. 78. Sedna: his son; built the royal city of Rath Alinne. 79. Nuadhas Neacht: his son; the 96th Monarch. 80. Fergus Fairgé: his son; had a brother named Baoisgne, who was the father of Cubhall [Coole], who was the father of Fionn, commonly called "Finn MacCoole," the illustrious general in the third century of the ancient Irish Militia known as the Fiana Eirionn, or "Fenians of Ireland." 81. Ros: son of Fergus Fairgé. 82. Fionn Filé (" filé:" Irish, a poet): his son. 83. Conchobhar Abhraoidhruaidh: his son; the 99th Monarch of Ireland. 84. Mogh Corb: his son. 85. Cu-Corb : his son; King of Leinster. 86. Niadh [nia] Corb: his son. 87. Cormac Gealtach: his son. Had a brother named Ceathramhadh. 88. Felim Fiorurglas: his son. 89. Cathair [cahir] Mór : his son; the 109th Monarch of Ireland. Had a younger brother named Main Mal, who was the ancestor of O'Kelly, of Cualan (of Wicklow, etc. ); and another, Eithne. Cu-Corb: This Cu-Corb had four sons—1. Niadh Corb. 2. Messincorb, a quo Dal Messincorb. 3. Cormac, a quo Dal Cormaic, and who was the ancestor of Quirk. 4. Cairbre Cluitheachar, who was the ancestor of Donegan (lords of Dal Aracht); of O'Dwyer (lords of Killnamanagh); of O'Urcha (which has been anglicised Archer); of O'Cooney, O'Kearnan, O'Conalty, O'Hartley; O'Arrachtan (modernized Harrington); O'Skellan (modernized Skilling); O' Congal, Clan Brian, O'Dubhcron, MacLongachan, O'Trena, O'Aodhan, O'Brangal, O'Corban, O'Dunedy, etc. 86. Messincorb: second son of Cucorb. 87. Eochaidh Lamhdearg: his son. 89. Garchu: his son; ancestor of O'Concuan, O'Tuatan, O'Cosney, O'Cearda, O'Conatta, O'Rappan, O'Hechinn, O'Broin (of Deilgne or Delgany), O'Ceallagh, O'Dubhan, O'Gobham (O'Gowan), O'Marcan (Marks), etc. This Garchu had two brothers—1. Naspre, who was ancestor of O'Fallan, O'Dinachar, O'Conag, O'Dubhcron, O'Donnan, O'Saran, O'Briony, Clan Ciaran, O'Teachtar, O'Convoy, O'Monay, etc. ; and 2. Nar, who was ancestor of O'Birinn, O'Deman, etc. ; all of these being Leinster families; but many of whom are now extinct. Ceathramhadh: According to some authorities Cormac Gealtach had a brother named Crimthan Culbuidh, who, in succession to his grand-nephew Cathair Mór, was by the Monarch Conn Ceadcathach made King of Leinster. This Cormac Gealtach is supposed to be the "Galgacus" of Tacitus, who led an army to Alba, to aid the Scots and Picts against the Romans, and was defeated by Agricola at the Grampion Hills.—See O'Halloran's History of Ireland, p. 217. Cahir Mór: This Monarch was King of Leinster in the beginning of the second century. He divided his great possessions amongst his thirty sons, in a Will called "The will of Cahir More," contained in the "Book of Leacan" and in the "Book of Ballymote." His posterity formed the principal families in Leinster: namely, the O'Connor "Faley," Princes of Offaley; O'Dempsey, O'Dunn, O'Regan, MacColgan, O'Harty, MacMurrough, Kings of Leinster; Cavenagh, O'Byrne, O'Toole, O'Murphy, O'Mulrian, or O'Ryan, O'Kinsellagh, O'Duffy, O'Dowling, O'Cormac, O'Muldoon, O'Gorman, O'Mullen, O'Mooney, and O'Brenan, chiefs in Kilkenny, etc.—CONNELLAN. 89. Cathair Mór, Monarch of Ireland: son of Felim Fiorurglas. Had amongst other children: 1. Ros Failgeach, from whom descended the O'Connor (Faley); 2. Daire, ancestor of O'Gorman; 3. Comthanan, ancestor of Duff, of Leinster; 4. Curigh, who was slain by Fionn MacCumhal (Finn MacCoole); 5. a daughter, Landabaria, who, according to the Ogygia, p. 315, was the third wife of the (110th) Irish Monarch Conn Ceadcathach (or Conn of the Hundred Battles), who succeeded Cathair Mór in the Monarchy; 6. Fiacha Baicheda. Curigh, No. 4 here mentioned, who was slain by Fionn MacCumhal, had a son named Slectaire; and a daughter named Uchdelbh (or Uchdamhuil), who was wife of Fionn Fothart, a son of Conn of the Hundred Battles. This Slectaire, son of Curigh, had a daughter Corcraine, who was the mother of Diarmid Ua Duibhne, and of Oscar, son of Oissin. 90. Fiacha Baicheda: youngest son of Cathair Mór; d. 220. 91. Breasal Bealach ("bealach:" Irish, large-lipped): his son; a quo O'Bealaigh, anglicised Bailey, Bailie, Baily, Bayly, and Bewley. Was the second Christian King of Leinster. 92. Enna Niadh: his son. Had a brother Labhradh. O'Toole or Ui Tuathail: The O'Tooles were Kings of Leinster and Princes of Imaile (now the counties of Wicklow and Kildare), Chieftains of Hy-Murray, Castle Kevin, Glendalough, and Powerscourt; and Omey in West Connaught. We are indebted to the Rev. Patrick Laurence O'Toole, O.C.C., Whitefriar-street Church, Dublin, for permission to inspect an elaborate genealogy of this family in that gentleman's possession; from which we here trace the genealogy more fully than we gave it in our Third Edition of "IRISH PEDIGREES." Motto—"Virtute et Fidelitate." One Branch of the Family has "Spero;" another: ''Semper et Ubique Fideles." The War Cry was: "Fianae Abu," and sometimes "Ui Tuathail Abu:" the former meaning "Victory to the Fenians;" and the latter, "Victory to the O'Tooles." Diarmid Ua-Duibhne: See Note "Fiacha Suidhe," in p. 359, ante. Kings of Leinster; and Chiefs of "Clan Moroghoe"
LABHRADH, a brother of Eanna Niadh who is No. 92 on the "O'Toole" pedigree, was the ancestor of MacMuircha; anglicised MacMorough, MacMorrow, and Morrow. II. Deagh, a quo Ui Deagha Mór; in Hy-Cinnselach. II. Eochu (or Eochaidh) Ceannsalach, who was exiled to Scotland by the Irish Monarch Niall of the Nine Hostages, whom said Eochu assassinated near Boulogne, on the river Leor (now the Lianne). III. Crimthann Cass, of whom presently. I. Ingen, wife of Daire MacErcadh of the Hy-Bairche. IV. Eithne Uathach, wife of Aongus MacNadfraech, King of Munster. V. Fergus, who defeated Diarmuid MacCearbhaill at Drum Laeghaire, by the side of Cais in Hy-Faelain, defending the Boromha. I. Owen Caoch, of whom presently. III. Faelan, who had a son named Fergus. I. Siollan, of whom presently. II. Fergus, ancestor of O'Ryan. MacMorough: The ancient kings of Leinster had fortresses or royal residences at Dinnrigh, near the river Barrow, between Carlow and Leighlin; at Naas, in Kildare; and in after-times at the city of Ferns in Wexford, which was their capital; and also at Old Ross in Wexford; and at Ballymoon in Carlow. The MacMoroughs were inaugurated as kings of Leinster at a place called Cnoc-an-Bhogha, attended by O'Nolan, who was the King's Marshal, and Chief of Forth in Carlow; by O'Doran, Chief Brehon of Leinster; and by MacKeogh, his Chief Bard; and the MacMoroughs maintained their independence, and held the title of "Kings of Leinster," with large possessions in Wexford and Carlow down to the reign of Queen Elizabeth. The Hy-Cavanagh or O'Cavanaghs were chiefs of the ancient territory which now comprises the barony of Idrone East, in the county Carlow; and in modern times became the representatives of the MacMoroughs, Kings of Leinster. Boromha: For the explanation of this tribute, see the Paper "Ancient Leinster Tributes," in the Appendix. CORMAC, brother of Eoghan (or Owen) who is No. 97 on the "MacMorough" pedigree, was the ancestor of O'Righin; anglicised Mulrian, O'Ryan, Ryan, and Ryne. 97, Cormac: son of Nathi. 98 Colman (also called Colum): his son; a quo Siol Coluim, now Colum. 100. St. Crohnmaol (22nd June): his son. 101. Aodh (or Hugh) Roin: his son. 102. Colman (2): his son. 106. Bruadar ("bruadar:" Irish, a reverie): his son; a quo O'Brua-dair, anglicised Broder, Broderick, and Bradner. 108. Righin ("righin:" Irish, sluggish, dilatory): his son; a quo O'Bighin. 114. Daithi (or David): his son. 118. Henry Mulrian: his son. Ryan: According to O'Donovan's "Antiquities," deposited in the Royal Irish Academy, Dublin, the O'Ryans of Idrone, county Wexford*, are a distinct family from the O'Ryans of the counties of Tipperary and Waterford. Others, however, say that all these families are of the same stock. Richard Ryan was born in 1796; his father was a London bookseller. He wrote a Dictionary of the Worthies of Ireland (Two Vols., 1821); Ballads on the Fictions of the Ancient Irish (1822); and Poetry and Poets (Three Vols., 1826). He died in 1849. *O'Hart means Carlow, not Wexford. This is a mistake in the original text. All the above is abstracted from O'Hart's book: Irish pedigrees; or, The origin and stem of the Irish nation. Here is the status of the Ryan DNA Project as of April 2018. There are 270 members in the project. Of these 176 have undertaken Y-DNA testing, 120 have done the Family Finder test (autosomal DNA, atDNA) and 70 have tested with mitochondrial DNA (mtDNA). The Big Y test was undertaken by 23 members thus far. Y-DNA results of all the project members are viewable on our Results Page here. 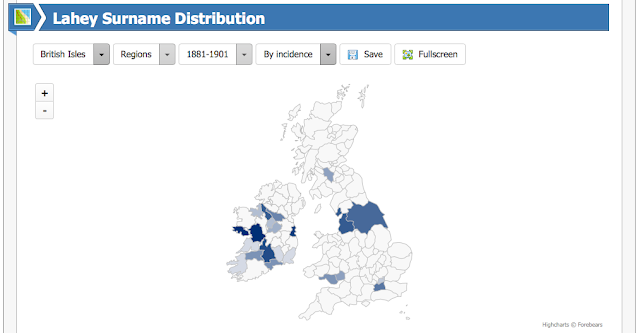 You can also see these on the FamilyTreeDNA Results Page here (but you have too be signed in to your FTDNA account). If you cannot see your results, it is probably because your Privacy settings are set to the default settings. You can change them by following the instructions in Point 4 here. As the focus of the project is Y-DNA testing, information on your earliest known direct male ancestor is of particular importance. Although 193 out of the 266 members have supplied some information on this ancestor, the actual birth location has been supplied in fewer than 40 cases. This is vital information as it helps to locate the origin of each specific genetic group. All members are encouraged to supply this information, either by emailing me directly (mauricegleeson@doctors.org.uk) so that I can add it to the Results Page; or alternatively you can enter the information yourself on your FTDNA webpage by following the instructions here. The 6 members of this group belong to Haplogroup I. Their terminal SNP is currently M223 as no one in this group has undertaken downstream SNP testing as yet (either via the Big Y or a SNP Pack). The Earliest Known Ancestor (EKA) information currently supplied is insufficient to give a clue to the origins of this group. This is the largest group and currently has 85 members. They belong to Haplogroup R, subgroup R1b - the most numerous group in Western Europe. Several members of this group have EKA origins in Tipperary and thus this group may represent the Tipperary / Limerick Ryans discussed in the Surname Dictionaries by Woulfe, MacLysaght, and others. Several members of this group have undertaken downstream SNP testing and the terminal SNP for this group appears to be M756. The 4 members of this group also belong to Haplogroup R1b but appear to be distantly related to Group 2 (and indeed the other R1b subgroups). There is insufficient EKA info (other than "Ireland" in 3 cases) so it is not possible to predict where they might be from. No downstream SNP testing has been undertaken as yet in this group, so we don't know where they sit on the Tree of Mankind. This group has 3 members, all of whom state Ireland as the EKA country of origin, and one further specifies Sligo as the birth location of his EKA. One person undertook (upstream) SNP Pack testing which has identified the likely major subclade for this group, namely Z253. In addition, the newest member has undertaken Big Y testing, and this has identified a SNP marker (A6119) for this particular group, which is further downstream than Z253 on the Tree of Mankind. Another 2-person group. 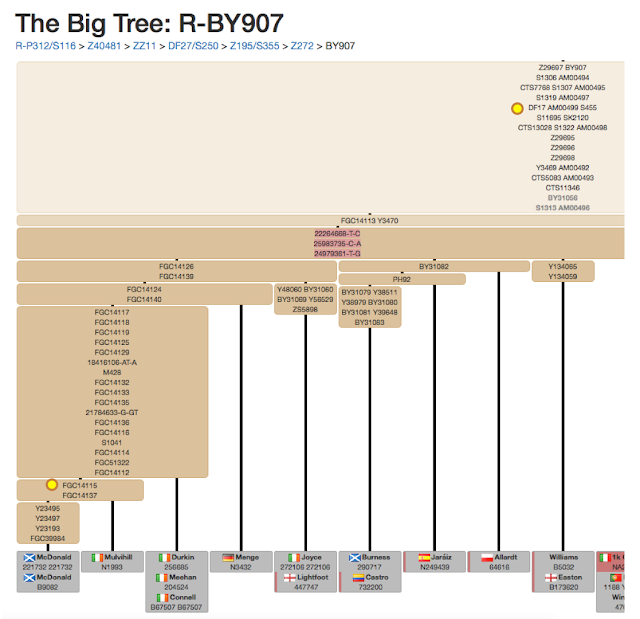 Haplogroup R1b again. No downstream SNP testing. No EKA birth location recorded. There are 4 people in this group (once again Haplogroup R1b). All have Irish origins and one has an EKA from Tipperary. Upstream SNP testing undertaken by one of the group indicates that he (and probably all the group) is L21+. This is a very common SNP marker in Western Europe and further downstream SNP testing will need to be done to find out exactly where on the Tree of Mankind these members sit and who their nearest neighbours are. Another 2-person group, but both have done the Big Y. The genetic distance between the 2 people is quite extreme (9/37, 14/67), but both test positive for BY182 as a terminal SNP and so I have grouped them together provisionally. In a later blog post we will look at how old this DNA marker is likely to be. No EKA birth location is provided. There is a large group of 42 people with direct male line Ryan ancestry who do not have a match in the project - 34 belong to Haplogroup R1b, and 8 belong to other haplogroups. Some may belong to rare Ryan subgroups and they are the first from that subgroup to test (and hence there is no match for them in the database). Others may be the result of a Surname or DNA Switch (SDS) at some time in the recent or distant past. This group will be explored in a separate blog post. Several people have joined the project who have Ryan ancestry but not on their direct male line. Their Y-DNA is therefore not Ryan-related and these people have been placed in the "Other Surnames" group and are not relevant to the present analysis of Y-DNA. 1) birth location is essential but often missing from member's profiles - I will be contacting individual members to supply this. 2) more in-depth analyses of each group will follow in due course, including assessment of their likely origin and their age. The in-depth assessments will attempt to address the questions highlighted on our Interpreting the Results page. If you want to get some idea about the possible origin of a particular surname, a Surname Dictionary is a good place to start. There are several surname dictionaries that address the topic of Irish surnames, and perhaps the three most well-known are those of Woulfe, MacLysaght, and O'Hart. The Rev. Patrick Woulfe (1872-1933), or as he preferred to be known, An tAthair Pádraig de Bhulbh, was born in Cratloe to Seamus Woulfe, a farmer. He became a priest, worked in Limerick, and spent 25 years collecting names, communicating with native Irish speakers and studying the different forms of Gaelic to compile the Irish Names and Surnames dictionary. There are two versions of his book – a small version (138 pages) and a larger version (742 pages). The smaller version was originally published in 1906 and reprinted in 1922 – this is available online in its as original print form from Archive.org here. The larger version was printed in 1923 (reprinted in 1967) and consists of 696 pages, with 46 pages of preliminary text. A digital version of the book is available free of charge online from Library Ireland here. The search feature is very useful and allows you to find any mention of a particular name within the book. Woulfe’s work helped to popularise the use of Irish first-names during the last century and has been an important resource for genealogists. 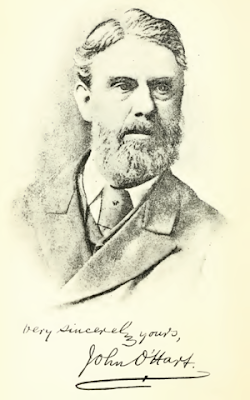 His work was subsequently superseded by that of other scholars, such as Edward MacLysaght. Woulfe, Patrick. 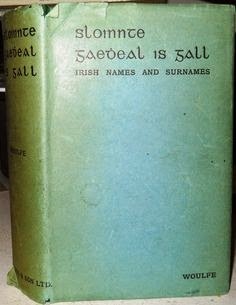 Sloinnte Gaedheal is Gall: Irish Names and Surnames, collected and edited with explanatory and historical notes (1923). Edward MacLysaght was an interesting character. He lived to be 99 years old (1887-1986) and packed a lot into his lifetime. His father was from Cork, his mother from Lincolnshire, and he was born near Bristol. He went to school in Rugby and then Corpus Christi College, Oxford to study law. But a rugby injury changed his life - he went to Lahinch in Co. Clare and lived in a caravan for 6 months recovering. During this time he developed a love for genealogy, history, and the Irish language, in which he became fluent. He started a pioneer farm in Raheen and introduced electricity 40 years before his neighbours. He also set up local community projects and was deeply involved in the Irish Cultural Revival and the movement for Irish independence. His loyal support of Eamonn de Valera (then member of parliament, and later President of Ireland) resulted in his imprisonment. After independence (1922), he was elected to the Seanad Éireann (the Irish Senate). He later became an Inspector for the Irish Manuscripts Commission (1938), a member of the Royal Irish Academy (1942), Chief Herald of Ireland (1943-1954), Keeper of Manuscripts at the National Library of Ireland (1948-1954), and Chairman of the Irish Manuscripts Commission (1956-1973). It was during this latter period that he wrote his indispensible books on Irish surnames. This is a comprehensive list of over 4000 Irish surnames with a short description of each. It includes 1500 surnames not considered in the other books below, which only deal with about 20% of the surnames described in this present book (albeit in a lot more detail). These latter two volumes (frequently abbreviated to IF and MIF) give a much more detailed account of many of the most common Irish surnames. Second hand copies can be bought online, usually for quite inflated prices. John O'Hart (1824-1902) was another interesting character. Born in Crossmolina, Co. Mayo, he was a self-taught genealogist who worked variously as a police officer, as an Associate in Arts (at Queens University Belfast), and at the Commissioners of National Education. He published several noteworthy books of genealogical relevance, but has been criticised for allowing his staunchly Catholic and Nationalistic views to influence what he wrote. He considered Gaelic myth and the writings of the Bible to be literal truth and incorporated this into his writing. He claimed that the Irish all descended from Milesius (King of Spain) who himself was the 36th descendant of Adam. Milesius allegedly emigrated from Spain in 1700 BC, which gives us an approximate date of birth for Adam of 2700 BC. O'Hart's work was very much part of the Gaelic Revival of the late 1800s which sought to re-imagine a highly idealised pre-Norman Gaelic past in order to inspire patriotic fervour in all things Irish. Thus the earlier parts of his pedigrees (from Adam to the birth of Christ) are largely fantasy fused with fragments of a Gaelic tradition. However, the later parts of his pedigrees can be very useful indeed. He relied on several well-known historical texts for the medieval pedigrees, including those of Cú Choigcríche Ó Cléirigh (Peregrine O'Clery, 1624-1664), Duald Mac Firbis (c.1620-1671) and Roger O'Ferrall (Linea Antiqua, 1709), as well as the Annals of the Four Masters. For pedigrees after 1700, he used the works of Bernard Burke (Burke's Peerage), John Collins and others. He also used original sources for constructing these pedigrees, many of which were subsequently destroyed in the major fire at the Public Record Office in 1922. The only problem is he never cited his sources so it is difficult to separate out fact from fantasy. Therefore, although the information contained in his books can be very helpful, it is in need of corroboration from other sources (if possible). O'Hart, John. Irish Pedigrees; or, The Origin and Stem of the Irish Nation, first published 1876, reprinted 8 times since then as expanded volumes. The 1892 edition is available from Library Ireland and is searchable via their Google custom search. It is also available (in its two volumes) from the Archive.org website (here are links to Volume 1 and Volume 2). O'Hart, John. The Irish landed gentry when Cromwell came to Ireland (1887). Available from Archive.org. So what do these various surname dictionaries say about the Ryan surname? 1) Ó MAOILRIAGHAIN, Ó MAOILRIAIN—O Mulrigan, O Mulryan, O Mulrean, Mulryan, Mulroyan, Mulryne, Mulrine, Mulrain, O'Ryan, Ryan; 'descendant of Maolriain' (follower of Riaghan or Rian); the name of a family of Leinster origin who settled in the 13th or 14th century in Uaithne-tire and Uaithne-cliach, now the baronies of Owney, in Co. Tipperary, and Owneybeg, in the east of Co. Limerick, where they became very numerous and powerful. In 1610, William Ryan surrendered to the king all his landed property and all his rights of or in the barony of Owney O Mulrian, and received them back by letters patent. The family property was, however, lost in the confiscations of the 17th century. There are many very respectable families of the name in Tipperary and Limerick, and the name itself is very common in these counties. It is to be distinguished from Ó Riain, which see. 2) Ó RIAGHAIN, Ó RIAIN—O Rian, O'Ryan, Ryan: 'descendant of Riaghan,' or 'Rian'; the name of a Carlow family who were lords of Uí Dróna, the present barony of Idrone, and are now numerous through Leinster; to be distinguished from Ó Maoilriain of Munster and Ó Ruaidhín of Connacht, which are both now incorrectly anglicised O'Ryan or Ryan. 3) Ó RUADHÁIN—O Ruane, O Rowane, O Roan, Ruane, Rouane, Roane, Ruan, Roan, Roon, Rowan, Rewan, Royan, (Ryan); 'descendant of Ruadhán' (diminutive of ruadh, red); also Ó Ruaidhín; the name (1) of an old Mayo family of the Ui Fiachrach, who possessed a district lying between Newbrook and Killeen, to the north of Ballinrobe; and (2) of an old Galway family of the Ui Maine race. No fewer than seven of the name were bishops of various sees in Connacht, in the 12th and 13th centuries. The name is still very common in that province, generally anglicised Ruane, but sometimes disguised as Ryan. 4) Ó RUAIDHÍN—O Ruyne, O Royn, O Roen, Rouine, Royan, Rowen, (Ruane, O'Ryan, Ryan); 'descendant of Ruaidhín' (diminutive of ruadh, red); the same as Ó Ruadháin, which see, both forms being used by the same family, and equally common in Connacht. Some of the name have been long settled in Leinster. 5) Ó SRAITHEÁIN, Ó SRUITHEÁIN, Ó SRUTHÁIN—O Srahane, O Shrihane, O Sreighan, O Shrean, O Streffan, Shryhane, Sruffaun, Strohane, Strahan, Straghan, Strachan, Strain, Bywater, (Ryan); 'descendant of Sruthán,' or 'Sruitheán' (diminutive of sruth, an elder, a sage, a man of letters); the name of an old Tirconnell family, the head of which was chief of Clann Snedhgile, a sept of the Cinel Conaill, seated in Glenswilly, to the west of Letterkenny, and also erenagh of Conwall in the same district. Some of the family had come southward before the end of the 16th century, probably as followers of the MacSweenys, and settled in Co. Cork, where the name is still extant, but often 'translated' Bywater, as if from 'sruthán,' a streamlet. In Co. Mayo, it is sometimes strangely anglicised Ryan. Comments: From the above, it would appear that there may be several different origins of the surname Ryan. And following from that, one might expect to see several different genetic signatures associated with the surname. That's the first point. Genetic Group 1: this relates to entry no. 1 above. Most members might have Tipperary or Limerick ancestry; some members might bear the surname Mulryan; the group might be placed on the Tree of Mankind next to branches that clearly originated in Leinster. Genetic Group 2: this relates to entry no. 2 above. The major surname variant is Ryan; members have ancestry from across Leinster, but mainly Carlow. Is there a pedigree for the Lords of Drone? Genetic Group 3: from entry 3 above. The predominant surname variant is not Ryan, but Rowen and similar; many have Mayo ancestry; connection to Ui Fiachrach genealogy. Genetic Group 4: also from entry 3 above. 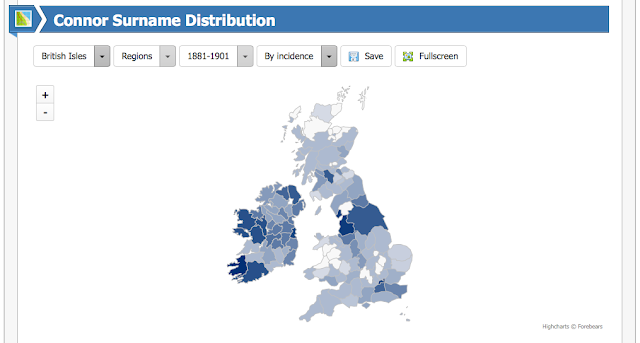 Predominant variant is Ruane, not Ryan; Galway ancestry; connection to Ui Maine. Genetic Group 5: from entry 4. Predominantly Ruane, Rowen, etc. Many from Leinster. Genetically similar to Groups 3 and 4. Genetic Group 6: from entry 5. Predominant surnames are not Ryan, but Strahan, etc. Many have Donegal ancestry. Genetically distinct from other groups. Connection to the Cinel Conaill "clan". These are possibilities to bear in mind when we come to exploring the genetic data and analysing what it tells us about the origins, surname variants, and "clan" associations of the various genetic groups. It will be important to approach this as objectively as possible and to avoid the natural tendency to fit the facts to our preconceived ideas. 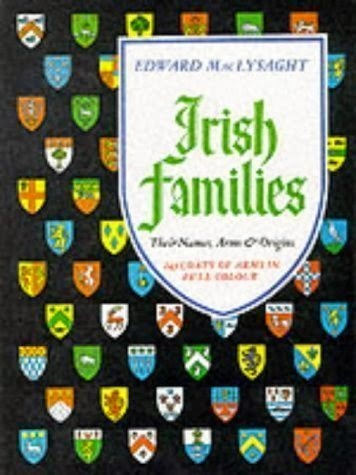 MacLysaght gives a brief account of the Ryan surname in his Surnames of Ireland (1957) and a much more detailed account in his Irish Families (1957). (O) Ryan Ó Maoilriain is the correct form in the homeland of the great sept of Ryan, formerly Mulryan; but it is now usually abbreviated to O Riain, which is properly the name of a small Leinster sept. Ryan is by far the most numerous name in Co. Tipperary having almost four times the population of the next in order (O'Brien and Maher). For a note on the derivation of Ryan see introduction, pp. xvi-xvii. Bibl. IF Map Tipperary (Mulryan), Carlow (O'Ryan). See Ruane. (O) Ruane Ó Ruadháin (ruadh, red). A sept of the Uí Maine. The variant Royan is found in the same area - Gortyroyan near Ballinasloe is Gort Uí Ruadháin in Irish. Royan, however, has inevitably been sometimes changed to Ryan by absorption, notably in Co. Mayo, as also have Rouine and Ruane. MIF Map Galway. RYAN, O'Mulrian Ryan is amongst the ten most numerous surname in Ireland with an estimated population of 27,500. Only a very small proportion of these use the prefix O. Subject to one exception, to be noticed later in this section, it is safe to say that the great majority of the 27,500 Ryan’s are really O'Mulryans – this earlier form of the name is, however, now almost obsolete: even in the census of 1659 in Co. Limerick Ryan outnumbers Mulryan by about four to one, and today there is not one O'Mulryan or Mulryan in the telephone directory. The sept of Ó Maoilriain was located in Owney, formerly called Owney O'Mulryan, which forms two modern Baronies on the borders of Limerick and Tipperary, in which counties the Ryan’s are particularly numerous today. They do not appear in the records of this territory (formerly belonging to the O'Heffernans) until the 14th century, but after they settled there, they became very powerful. Nevertheless they did not produce any really outstanding figures in Irish history or literature, except the romantic character known as Eamonn a 'chnuic, or Ned of the hill, i.e. Edmund O'Ryan (c. 1680-1724), Gaelic poet, gentleman, soldier and finally rapparee, beloved of the people, though he met his death through the treachery of one of them. Two abbés called O Ryan were executed during the French Revolution. Luke Ryan (c. 1750-1789) first an officer in the Irish Brigade, made a huge fortune as a privateer, was condemned to death and four times reprieved and having been cheated out of his money died in a debtor's prison. Many Ryan's have distinguished themselves in the United States. Father Abram Joseph Ryan (1838-1886) of a Clonmel family, was poet of the Confederates in the Civil War; another Tipperary man, Patrick John Ryan (1831-1911) was Archbishop of Philadelphia, and Stephen Vincent Ryan (1826-1896) from Clare, was Bishop of Buffalo. In other walks of life the most noteworthy Irish American of this name was Thomas Fortune Ryan (1851-1928), a millionaire who began life as a penniless youth. The Ryan's of Co. Carlow and other counties in that part of Leinster, are distinct from those dealt with above, though both are of the race of Cathaoir Mór, King of Leinster in the second century. These are Ó Riain, not Ó Maoilriain: the chief of this sept was lord of Ui Drone (whence the name of the barony of Idrone in Co. Carlow). Comments: In MacLysaght's description, the Ryan's of Limerick/Tipperary take centre stage and he does not add any substantial additional information about them that we did not already know from Woulfe. The only new information is that the Carlow Ryan's and the Limerick/Tipperary Ryan's are related, both descending from Cathaoir Mór, King of Leinster. This should be reflected in the DNA if it is true. There should be a genealogy for this king and it may indicate when the Carlow Ryan's and the Limerick Mulryan's branched apart. The date of this branching point could also be confirmed by DNA. MacLysaght's entry for Ruane, Rowen, and other potential surname variants will be the subject of a future blog post. There is a brief mention of the Ryan surname in O'Hart's book Irish pedigrees; or, The origin and stem of the Irish nation. THE following is a brief summary of the Irish families in Munster, beginning with the three branches of the race of Heber: namely, the Dalcassians, the Eugenians, and the Clan Cian. VII. Of the Leinster Milesians of the race of Heremon, were some chiefs and clans of note in Munster, as O'Felan, princes of Desies in Waterford; and O'Bric, chiefs in Waterford; O'Dwyer and O'Ryan, chiefs in Tipperary; and O'Gorman, chiefs in Clare. 30. O'Ryan and O'Felan were ancient families of note in Kilkenny, as well as in Carlow, Tipperary, and Waterford. Comments: It is difficult to know which timescale O'Hart refers to in these brief descriptions. They do not add anything to what we already know from Woulfe & MacLysaght. O'Hart also lists some Ryan pedigrees, namely Ryan (No.1) and Ryan (No.2). These will be discussed elsewhere. The information in these surname dictionaries gives us some idea of what to look out for in the DNA data, and serves as a basis for further research into the various potential genetic groups identified. To recap, here is the list of genetic groups that we may find among the DNA results if the content of these various surname dictionaries is correct. Genetic Group 1: this relates to entry no. 1 from Woulfe. Most members might have Tipperary or Limerick ancestry; some members might bear the surname Mulryan; the group might be placed on the Tree of Mankind next to branches that clearly originated in Leinster. Genetic Group 2: this relates to entry no. 2 from Woulfe The major surname variant is Ryan; members have ancestry from across Leinster, but mainly Carlow. Is there a pedigree for the Lords of Idrone? MacLysaght's entry suggests that this group may be distantly related to Group 1 above. Genetic Group 3: from entry 3 from Woulfe The predominant surname variant is not Ryan, but Rowen and similar; many have Mayo ancestry; connection to Ui Fiachrach genealogy. 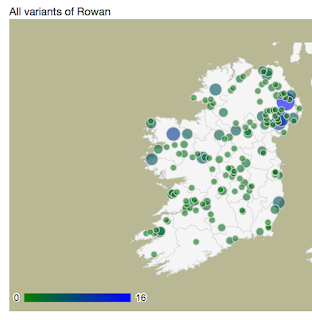 Genetic Group 4: also from entry 3 from Woulfe Predominant variant is Ruane, not Ryan; Galway ancestry; connection to Ui Maine. I am a genetic genealogist and run Surname DNA Projects for the following surnames: Spearin, Farrell, Gleason, Boylan, O'Malley, and Ryan. I am Education Ambassador for ISOGG, organise the Genetic Genealogy Ireland conference each year in Dublin, and have a blog and a YouTube Channel, both called: DNA and Family Tree Research.